Dental bonding is one of the easiest and least expensive methods used to repair teeth or change their appearance. The bonding procedure uses a tooth-colored composite resin, a strong and durable plastic material (sometimes mixed with glass). The procedure is called bonding because a special light is used to apply and harden the material, in effect bonding it with the original tooth. The resins come in a great range of shades and colors, so your dentist can choose one that matches the color of your tooth well. In fact, it will be virtually impossible to distinguish the bonded tooth from the others. Bonding material will not last as long as a veneer, but the procedure can typically be completed in a single visit to the dentist. First, your dentist will use a shade guide to select a composite resin color most closely resembling that of your tooth. Then, the surface of the tooth to be bonded will be cleaned and “roughened”, and a conditioning gel applied. This opens up tiny pores in the tooth’s surface and aids the bonding material to properly adhere to the tooth. Next, the tooth-colored, clay like resin is applied and molded to the desired shape. 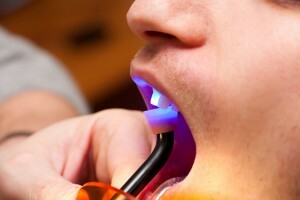 A special curing light is used to harden the material. More layers of resin may be applied, if necessary. Your dentist will then shape and trim the tooth until it looks and feels right. Once the tooth has been fine-tuned and fits well into your bite, it receives a final polish. The procedure usually takes somewhere between 30 minutes to an hour to complete. Bonded teeth should be treated just like normal teeth. Brush and floss them daily, and continue a to see your dentist regularly for professional cleanings. You will also find that the composite resin of bonded teeth absorbs stains, just like normal teeth. Smoking, red wine, coffee and tea will cause discoloring; however, bonding material cannot be lightened. So if you choose to undergo a tooth whitening process, be aware that a bonded tooth may not match your natural teeth. Finally, it’s important to remember that bonded teeth can chip more easily than normal teeth. You should avoid biting your nails, chewing on hard objects (like pens, ice, or hard candy), or any other activity that could put excessive force on the bonding material (like using your teeth as an opener). How Long Should Bonded Teeth Last? The lifespan of your bonded tooth depends on the type of material used, how much bonding was done, and your personal oral habits. Typically, though, bonding material lasts up to 10 years without any need for repair or replacement. If you feel you would benefit from dental bonding, make an appointment with the Yuba City Dentistry Group today and we’d be happy to discuss your options.